Dr. Laura Markham is the author of Peaceful Parent, Happy Kids: How To Stop Yelling and Start Connecting, published by Perigee in November 2012. Dr. Markham earned her Ph.D. in Clinical Psychology at Columbia University in New York. Her clinical practice is entirely devoted to coaching parents, with clients from New York to Australia (via Skype). She monitors the pulse of parents’ needs through her very active social network, including her own web site, AhaParenting.com. She speaks frequently with reporters for press as diverse as CNN and Parents Magazine and makes regular TV appearances. Dr. Markham lives in Park Slope, Brooklyn, with her family—and considers her kids – a daughter graduating from high school and a son graduating from an Ivy League university—to be proof that her parenting approach produces responsible, self-disciplined, considerate and happy kids who achieve in the world and stay deeply connected to their parents. "Refreshingly positive and respectful in its tone, Peaceful Parents, Happy Siblings lovingly guides parents by using scripts and practical examples, essential tools for any parent with more than one child. Dr. Laura's compassionate approach is empowering for parents, and liberating for children." 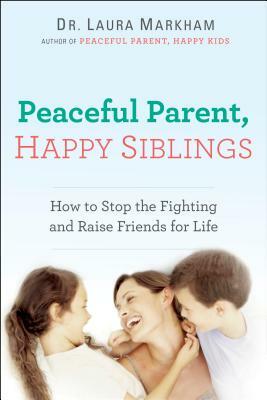 " Dr. Laura's examples and coaching-based methodology make parenting siblings far less daunting....Her book reassures us that doing our best with the right tools, including self-regulation, connection, and coaching, can build a much happier and more peaceful family."